Search engine optimization is like a sassy cat. You can give it attention, affection and constant love, but somehow you’re getting zero love back. I hate to say it, but it might not be the cat–er SEO itself. Search engines like Google, Yahoo and Bing are constantly trying to improve their formulas for finding the best search results. The better the results, the easier to find things and the more often people come back to search. On one hand it means we’re constantly getting better search results and finding solutions to our problems faster each day. But on the other hand, since things are constantly evolving there are a lot of people who are spreading bad or outdated information. And with that comes a lot of SEO mistakes. 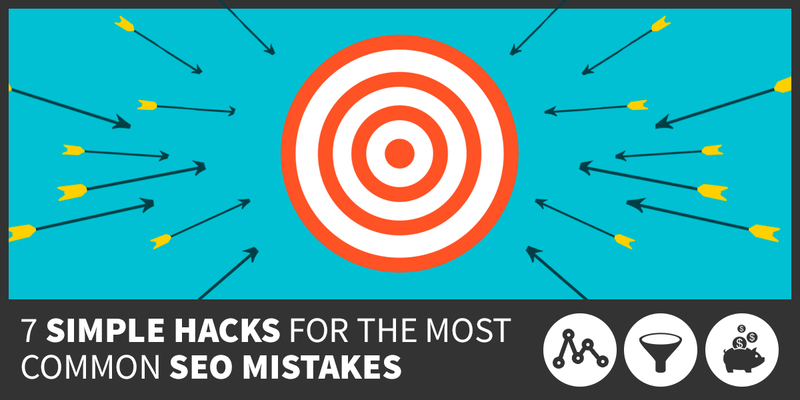 We’ve compiled a list of the 7 of the most common SEO mistakes along with some quick tips on how to avoid them. Keyword research is the backbone for all SEO. The keywords you discover will influence a ton of SEO factors like descriptions, metadata, URL choice, visible link text and so much more. But when you go straight for keywords without doing any research you can really hurt yourself. You may already know a lot about your customers and what types of words they’re using to conduct searches, but that’s only half the battle. You need to see how many other people are also using those keywords and phrases. You may find there are keywords available that aren’t super popular, but with less competition you’re more likely to rank for those keywords. If you’re a pet sitter, groomer, walker or boarding facility targeting a geographic area you cannot ignore local searches. Every time you do a search for a pizza place, hair salon, dry cleaner or any other type of business in a certain city you’re conducting a local search. With these types of searches Google retrieves standard results as well as results which give the business name, phone number and reviews that display at the top of page one. These results are local results. They’re so important because they’re likely the first thing a potential client sees regarding your business. As the business owner you can claim your business listing. Once you claim your listing you can ensure information is correct, especially the website link. You could be missing out on a ton of free traffic by not adding your website to your business listing. I’ll be honest, this one can take a little bit more work to correct than the others. Bad content has spelling errors and is nothing but dull, offensive or outdated information. Good content is entertaining, educational and engaging information with your unique flair. You don’t have to be perfect, but you do have to constantly be pushing yourself to create high quality content that visitors will love. It can sometimes be hard for pet professionals to get out of the professional mindset. You spend so much time learning about what’s going on in the industry and working hard to keep a professional outlook on things. But when it comes to SEO you have to take into account what your ideal customers are searching for, and not necessarily the proper professional terms they should be using. The most common questions you get from customers. How you simplify things for confused customers. What problems your business solves. How your product/service makes life easier. Having multiple website pages with the exact same content may seem like just an organizational mess, but it could be hurting your website more than you think. The problem is when you have more than two pages with the exact same information the search engine crawlers get confused. They don’t know which is the original, which can throw off how they rank the pages. On top of that, when you have duplicate content you’re splitting your traffic. So instead of having 40 visitors to one page, you might have 20 visitors to each of those two pages. It’s much more beneficial to have just one point of entry and once place where traffic can be counted. On the outside SEO seems like this ultra nerdy process. You need to run numbers, check research and understand algorithms. But there is a much more human element to the process. Before you can get started with SEO you need to understand your customers and ideal buyers inside and out. By understanding their mindset and behaviors you’ll know where they are in the buying process and better be able to craft keywords and phrases that they’re more likely to use. SEO is like going to the dentist. You need to keep up with it and do regular checkups to make sure everything is working. If there are problems you want to jump on them quickly, so you avoid long-term damage. If you neglect your teeth for years a dentist can only fit you for artificial chompers and send you on your way. SEO works the same way. You’re not going to see instant results. You will however see small improvements over time, which are a reflection of how much work you put into it. That’s not to say if you’re not doing well on SEO, don’t even bother. Rather, it’s important to start with SEO as soon as you can and do as much as you can to keep your SEO going strong.